Transport is one of the big consumers of energy. As we have seen in some of my previous posts, there is a clear tendency to become more energy efficient. Does this also apply to energy used for transport purposes? Eurostat provides a collection of data on this issue which may give us an answer. Let us look at the transport energy per unit of GDP. This is certainly a sensible measure since we may consider a link between economic activity on the one hand and transport (of both people and goods) on the other. So whenever the economy is growing (or shrinking) transport is likely to follow suit. We consider here the case of Germany, France and UK, i.e. the biggest economies of Europe. 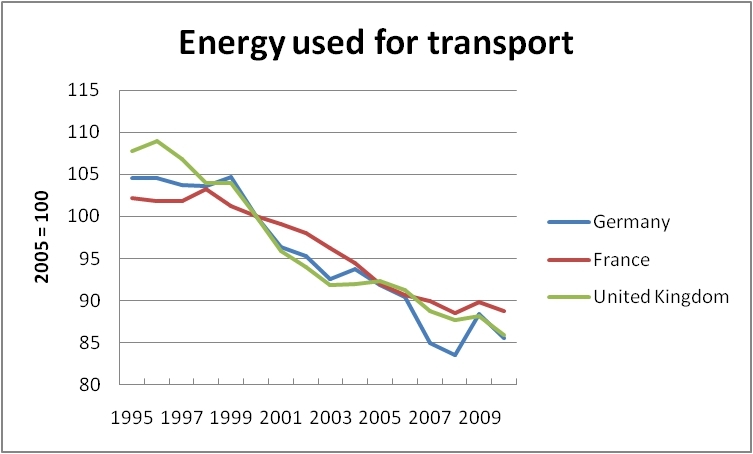 The figure below shows how energy demand for transport per unit of GDP has developed since 1995. The curves are indexed with 2005 = 100. Energy demand for transport purposes per unit of GDP. The message behind this figure seems to be obvious. Over the past 15 years there has been a certain decoupling of economic performance and energy demand for both passenger and goods transport. Thus per unit of GDP less energy is used for transport. We are becoming more energy efficient. Having a closer look at the figure we may also observe that the downward trend is still unbroken, i.e. there is no flattening tendency. This leads us to the conclusion that there is room for further improvement of energy efficiency in the transport sector. Becoming more energy-efficient is one of the major challenges of our time. Modern societies are highly energy-dependent and thus all efforts to save this valuable resource are more than welcome. For many years, or rather decades, the responsible people, politicians and experts, have urged the importance of using less energy. We may ask ourselves what has been achieved so far. We may equally ponder about future developments. How much more can we save? In this posting we investigate the achievements of getting more energy-efficient in the UK from a sectorial point of view. The country can serve as a typical example of a European state trying to do both, using less energy for the same economic outcome and reinforcing its potential of renewable energies. The raw data for our analysis have been taken from UK National Statistics. We consider the following sectors: Industry, domestic, services, passenger transport and freight transport. The energy consumption of the various sectors is measured as follows: industry (Mtoe/unit of output), domestic (Mtoe/household), services (Mtoe/unit of value added), passenger transport (Mtoe/person-km), freight transport (Mtoe/tonne-km). The transport sectors cover road transport only. In order to see how well each sector is doing compared to the others, we have indexed the quantities as 1980=100. The results is given in the figure below. 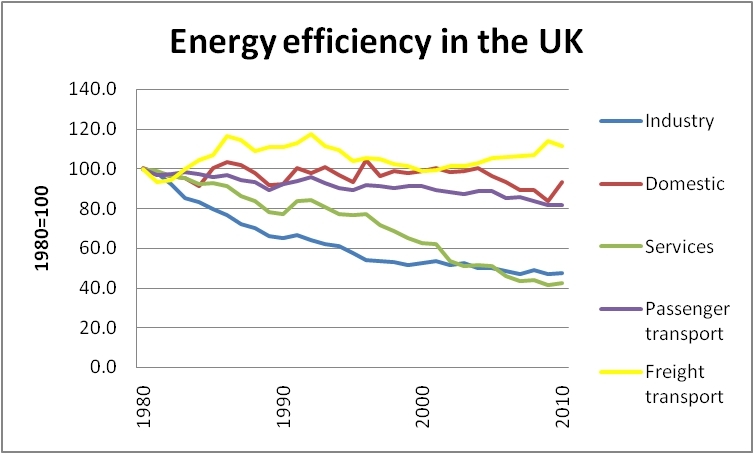 Energy efficiency in the UK for various sectors. This picture reveals immediately who the good and the bad guys are. Let´s start with the good ones. Both industry and services managed to reduced their energy use per unit of output considerably. In fact, in 2010 British industry was able to produce more than twice as many goods per unit of energy as in 1980. Within 30 years the index went down to less than 48. The services sector was even more successful. During the same period its specific consumption plummeted to an index value of 43 only. The situation looks quite a bit different for the other sectors with passenger transport being the most successful among those. Since 1980 the use of energy per passenger-km has decreased by almost 20 % (index 81.9). Unfortunately, freight transport cannot compete with that value. Instead its energy consumption per tonne-km went up by almost 12 % during the reference period. This finding is both, surprising and disappointing at the same time. Surprising, because car producers make us believe that modern vehicles need less gasoline than older ones. Disappointing, because freight transport is the only sector showing a clear increase in its energy hunger. When looking at the figures for household consumption we may equally feel disappointed. There is a slight tendency to use less energy per household, with the index being at 93 in 2010. This is a rather weak performance when compared to the other sectors with the notable exception of freight transport. Countless public campagnes have been run with the clear goal of getting more energy efficient. It is hard to imagine that millions of households have not got the message. However, the results are meagre. Why is that so? Is there too little incentive for households to save energy?